​This ministry is about building friendships and community on the foundation of Jesus Christ. Beginning with Worship, and continuing with Teaching and Praxis, we have a variety of lessons and activities designed to support and actively build the body of Christ. Come join us! On July 8, 2018 we celebrated two anniversaries. Read about the event and see the pictures at this link. April 1992: Eastern Pennsylvania Deanery of the Antiochian Orthodox Christian Archdiocese discusses and approves the concept of planting a mission parish somewhere in Harrisburg, York or Lancaster. July 1992: Fr. Peter Gillquist, Head of the Department of Missions and Evangelism approves placing ads in newspapers to ascertain if there is interest in an English speaking Pan-Orthodox mission parish in the Harrisburg or York areas. September 1992: Ads are placed in the Harrisburg Patriot News, the Carlisle Sentinel, the York Daily Record. Letters are mailed to families in those areas who once had an affiliation with the Antiochian Orthodox Christian Archdiocese. There is a positive response to these overtures and approximately 20 families indicate they would be interested in founding a mission parish. Most families are from York and York is chosen as the location for the mission. Two house meetings are held for people to discuss the proposed mission and to meet one another. The fist house meeting is held in the home of Michael and Carole Buleza. The second is hosted by Dr. Sam and Karen Solomon. October 1992: Fr. Peter Gillquist comes to York and meets with interested families. He urges families to make a financial commitment to the mission and submit this to the Archdiocese for Metropolitan Philip’s consideration. On Saturday, October 31, 1992 Fr. Boniface Black of St. Philip’s Souderton, Pennsylvania celebrates the missions first Divine Liturgy at Advent Lutheran Church on East Market Street. 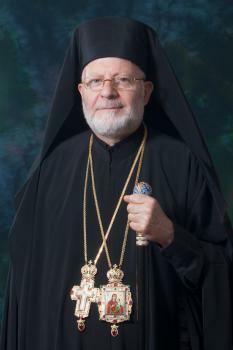 November 1992: Metropolitan Philip places the York mission church under his omophor and declares it a mission parish of the Antiochian Orthodox Christian Archdiocese. He, and his Auxiliary Bishop, Antoun, choose St. John Chrysostom as the patron Saint for the new mission. December 1992: Peter Pier is ordained a Deacon to serve the mission. 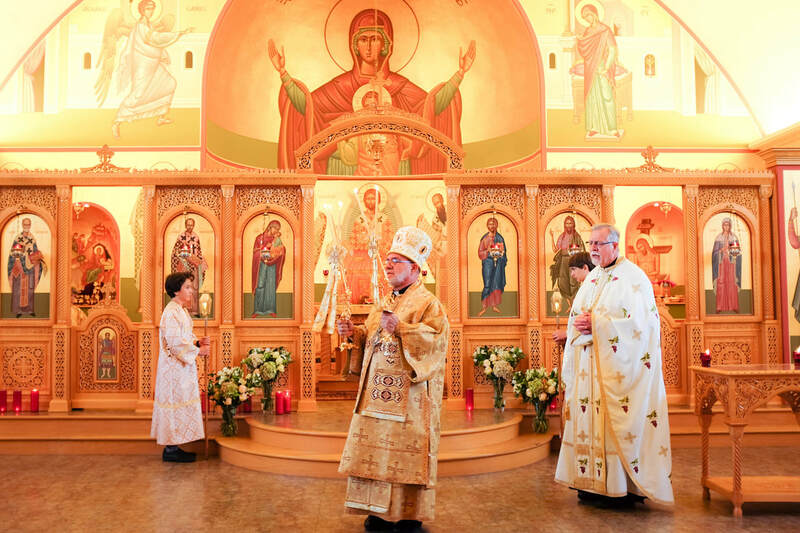 He is ordained on Christmas Eve at St. Philips Antiochian Orthodox Church, Souderton, Pennsylvania. January 1993: On January 17th Dn. Peter is ordained a Priest by Bishop Antoun at St. Mary’s Antiochian Orthodox Church, Wilkes-Barre, Pennsylvania. Shortly thereafter St. John Chrysostom Mission moves to St. Luke United Methodist Church on West Street. April 1995: 13.8 acres of land is purchased bordering N. Sherman Street and Druck Valley Road. March 2004: Construction begins on the Church and a Sunday Church School wing. Construction is completed in early November and Bishop Antoun consecrates the Church, on behalf of Metropolitan Philip, on the parish’s Patronal Weekend in November. August 2007: Elias Katsaros begins the first phase of the parish’s iconography project. Icons of the Pantocrator and Platytera are written in the dome and apse of the church. The first phase of the iconography project continues through 2016.
reposed in the Lord on Wednesday, March 19, 2014.